Aquilegia formosa looks quite exotic, but it is a California native. There is a certain magic about the columbines. The shape of the Crimson Columbine flowers is rather otherworldly with the deep nectaries. If you are looking for a hot color from yellow, through orange to brilliant red, this Crimson will certainly put a smile on your face. Aquilegia formosa is native to the higher elevations of the Southern Sierra Nevada range where it grows in moist meadow settings, to near the coast further North. 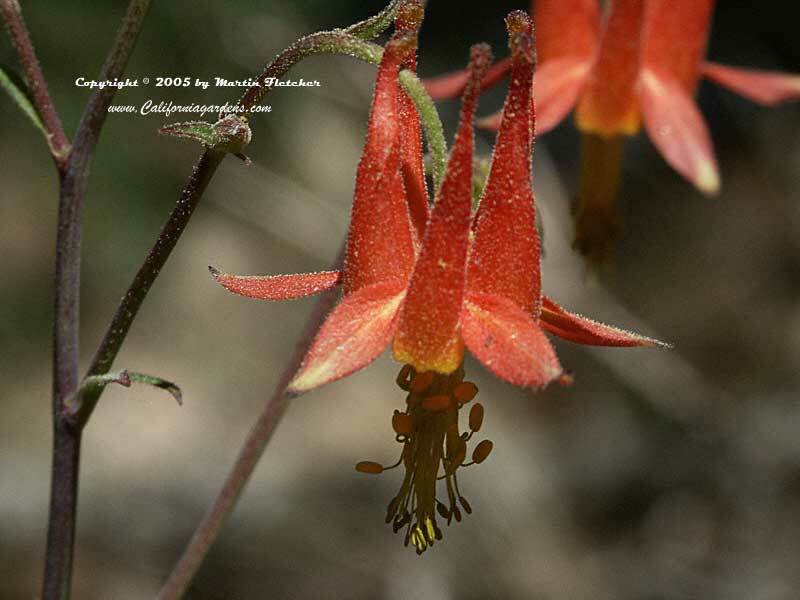 The Western Columbine is a nectar source for hummingbirds and butterflies, and is a great addition to the hummingbird and butterfly gardens. Aquilegia formosa will grow in a meadow setting near the coast. You can see the Western Columbine in a cultivated setting at the Santa Barbara Botanic Gardens, in Santa Barbara, they have a great wildflower garden in their meadow section. Flowers of Aquilegia formosa the Western Columbine or Crimson Columbine. High resolution photos are part of our garden image collection.